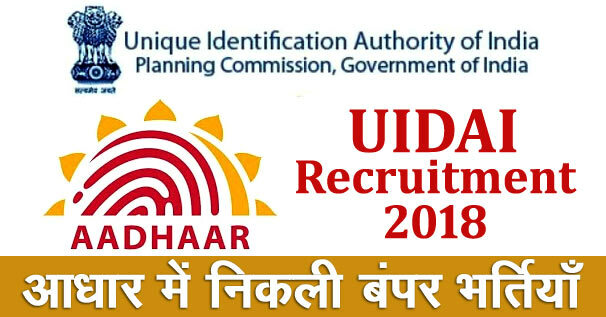 UIDAI Recruitment 2018 - Under Unique Identification Authority of India (UIDAI), there is recruitment for the vacant posts of Private Secretary : 02, Stenographer : 01 etc. application are invited online from the desired and eligible candidates for total 07 posts. In respect of this recruitment, the vacant number of posts is 07. Some among the given posts as per rule are reserved for the candidates of different categories. The number of posts may decreased or increased. Starting date for online application registration is 05 March, 2018 and the last date for the application submission is 24 April, 2018. For more information as about total no. of posts, age limit, educational qualification, selection process, application fee, important dates, how to apply etc., regarding this recruitment visit the official website of UIDAI http://www.uidai.gov.in. Education Qualification : Candidates should have done 2 years regular service / having passed SAS,SOGE / Having Professional degree of CA or ICWA / 5 years experience in finance,accounts and budge related matters. Other education qualification details please go to official notification. Age Limit : Candidates upper age limit should not exceed 56 Years As on 27-04-2018. Upper age relaxation will be given to reserved category as per the organization norms. More details please go to official notification. Pay Scale : Rs. 15,600 - 39,100/- with Grade Pay 5400/- (Post 1), Rs. 5200 - 20,200/- with Grade Pay 2800/- (Post 3), Rs. 9300 - 34,800/- with Grade Pay 4200/4800/- (Post 2,4-6). Selection Process : To know selection process details please go to official notification. How to Apply : All Eligible and Interested candidates Can Download application Form through official website http://www.uidai.gov.in. After Filling The application form, candidate must send hard copy of application along with relevant testimonials (Mentioned In Detailed Advertisement) to the following Address before or on 27th April 2018. Postal Address : ADG (Admin), Unique Identification Authority Of India, (UIDAI), 7th Floor, MTNL Exchange Building, GD Somani Marg, cuffe Parade, Mumbai- 400005.